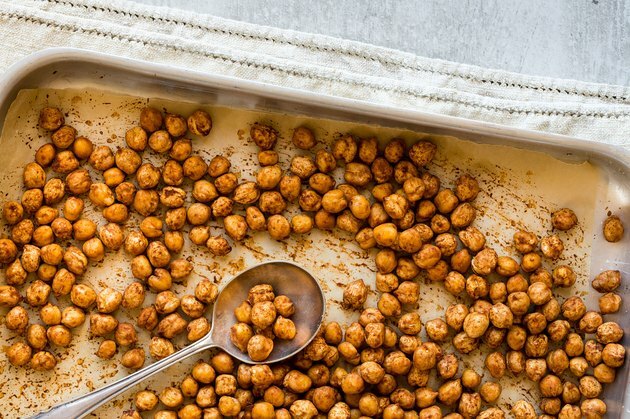 Chickpeas have exploded in popularity, and it's easy to see why. They're the essential ingredient in beloved foods like hummus, falafel, roasted chickpeas and vegetarian curries. Meanwhile, global demand for plant-based foods is on the rise. And as people try to find ways to eat less meat, they're seeking out plant-based proteins that are all natural, nutrient-dense and gluten-free to add to their food diary. The mighty chickpea checks all three of those boxes. We know you probably have some pressing questions (Is hummus good for me, and will chickpeas give me gas?). Since I wrote a book about pulses, the umbrella term for beans, lentils, dry peas and chickpeas, I know what's good when it comes to garbanzos. Read on to find out everything there is to know about chickpeas and ways to add some simple, healthy chickpea recipes to your arsenal. Chickpeas are a type of pulse, a unique category within the legume family that are low in fat and high in protein and fiber. Chickpeas are actually the most widely consumed pulse in the world. They're now grown in more than 50 countries, but were originally cultivated in the Middle East and Mediterranean (which is why many people associate them with hummus). There are so many delicious ways to enjoy chickpeas. Chickpea flour can be used in baking or blended into smoothies. Whole chickpeas can be oven-roasted and enjoyed as a snack or added to salads, and they're the base for Indian chana masala. Pureed chickpeas can be used to thicken soups or sauces. Meanwhile, mashed chickpeas can serve as an egg replacement in a veggie breakfast scramble, or form the base of plant-based chickpea patties. 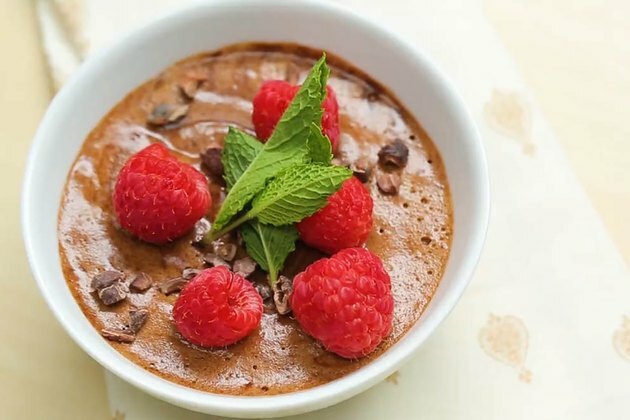 These days, you can find a wide variety of chickpea-based desserts and treats, from chocolate-covered chickpeas and chickpea-powered protein bars to chickpea cookies, brownies and cupcakes. Mousse and meringue can also be made from aquafaba, the fluid found in canned chickpeas or the liquid left over when the dry seeds are soaked and boiled. Is there protein in chickpeas? One cup of canned, drained, rinsed chickpeas provides 10 grams of protein. That's a decent amount, but it's worth noting that this portion also supplies 34 grams of carbohydrate, with about 10 grams from dietary fiber. When relying on chickpeas as a protein source, keep the carbs in mind. If you're pairing them with another carb-rich food, such as quinoa, sweet potato or fruit, watch the portions to prevent carb overload. What is the nutritional value of chickpeas? In addition to their protein, carb and fiber content, a cup of chickpeas provides 210 calories and less than four grams of fat. But when it comes to chickpeas' nutrition, they're a true powerhouse food. 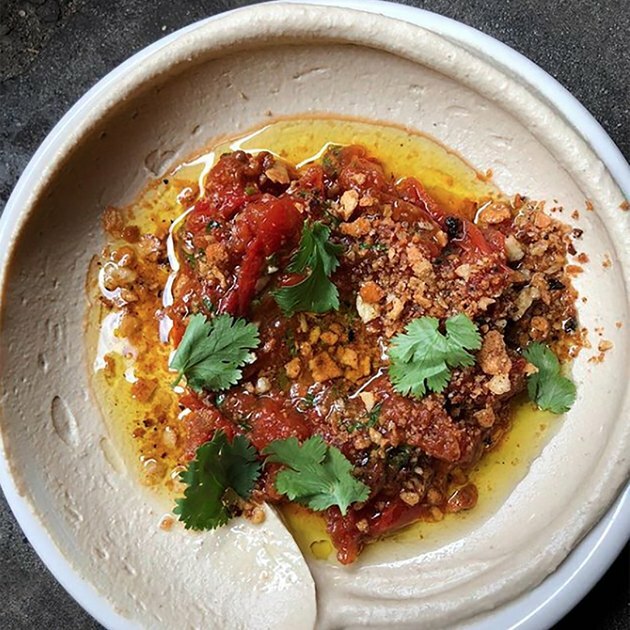 According to a study published in the journal Nutrients, people who regularly consume chickpeas and/or hummus have higher intakes of several key nutrients. These include fiber, vitamins A, E and C, folate, magnesium, potassium and iron. Chickpeas are also chock-full of antioxidants. While the most common type consumed in the U.S., known as kabuli, are cream-colored, there are multiple types and hues of chickpeas. Smaller and darker desi chickpeas pack a greater antioxidant punch. You'll find them in Indian markets or specialty-food stores. Are chickpeas good for weight loss? Yes! Eating more chickpeas is a simple and effective weight-loss strategy. According to government data, chickpea/hummus consumers were 53 percent less likely to be obese. They also had lower BMIs and waist measurements compared to those who did not consume chickpeas or hummus. One Australian study, published in Appetite, asked 42 volunteers to consume their usual diets, plus about three-and-a-half ounces of chickpeas daily for 12 weeks, and then return to their typical diets for a month. 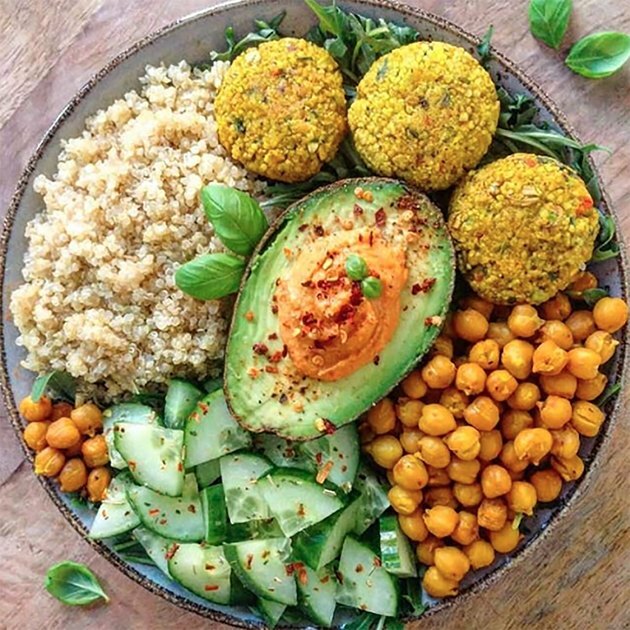 The participants' food diaries revealed that they ate less from every food group, particularly grains, during the three-month chickpea intervention. They also reported feeling more satisfied during the chickpea experiment. And in the four weeks after the study ended, their intake of processed snacks spiked. Are chickpeas good for my health? In addition to their ability to support weight loss, chickpeas improve gut health and help protect against heart disease, Type 2 diabetes and certain cancers. In one study, blood sugar levels were significantly lower 45 minutes after volunteers ate hummus with white bread, as compared to white bread alone. This suggests that hummus may be able to partially offset glucose spikes triggered by eating high glycemic index foods. In animal research, scientists found a 65 percent reduction in precancerous lesions in rats whose diets contained 10 percent chickpea flour. Another concluded that after eight months, rats fed a high-fat diet plus chickpeas had less belly fat and improved lipid profiles as compared to rodents that ate a high-fat diet alone. Will chickpeas give me gas? You may experience more gas when you first up your chickpea intake, but your body will adapt. One study from Arizona State University actually measured this using beans. Over eight weeks, 40 volunteers added either a half-cup of canned carrots daily or a half cup of beans. Within the first week, about 35 percent of the bean eaters reported an increase in flatulence. (Note: 65 percent did not!) By week two, only 19 percent reported excess gas. And the number continued to drop weekly — down to 3 percent by week eight, the same response as the carrot eaters pegged as the control group. Because chickpeas are in the same family as beans, you can expect a similar GI adjustment. If you purchase canned chickpeas, rinsing them thoroughly can also help curb bloating. How do you cook chickpeas? Buying canned chickpeas is A-OK, but if you want to buy them dried and cook them yourself, it's easy. For a quick soak use three cups of cold water for each cup of chickpeas, boil for two minutes, remove from heat, cover and let stand for one hour, then drain. After soaking, combine three cups water for every cup of chickpeas, bring to a quick boil, and then simmer for one-and-a-half to two hours. The ingredients in premade hummus can vary widely. Some are simply made with chickpeas combined with olive oil, tahini and seasonings like garlic, salt, pepper and lemon juice. Others, however, can be made with lower-quality oils (like soybean oil) and artificial preservatives. When shopping for hummus, read the ingredient list first. It should read like a recipe you could have made in your own kitchen. One of my favorite brands is Hope. Its original version is made with chickpeas, water, tahini, extra-virgin olive oil, sea salt, lemon juice, spices, citric acid (to preserve freshness), garlic powder and cayenne. A clean-ingredient hummus is a healthy snack when paired with raw veggies. It can also be used as a creamy salad dressing, a thickener for soup, a mayo alternative or topping for cooked potatoes or spaghetti squash. What’s the deal with chickpea pasta? Chickpea pasta is made with chickpea flour instead of semolina, or wheat-based flour. The formulations vary, however, so be sure to check the ingredients. Some brands bolster the protein content by adding pea protein derived from yellow split peas (another type of pulse), and others add white rice flour. 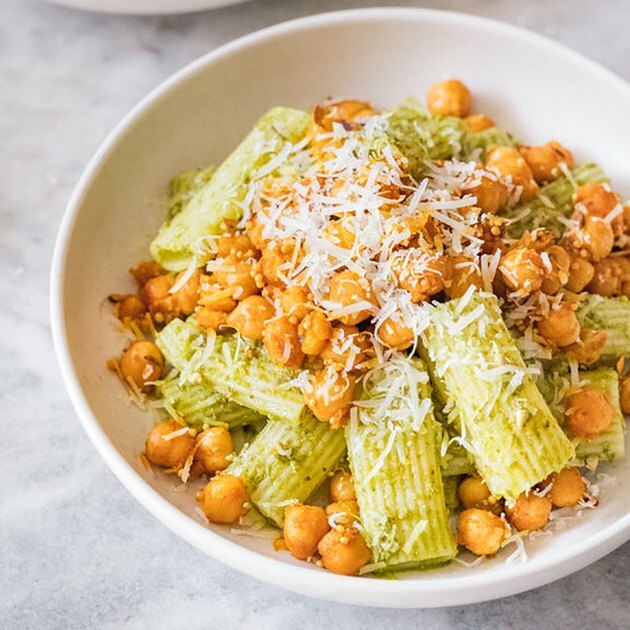 The main benefits of chickpea pasta are that it's gluten-free and generally higher in protein, fiber and nutrients as compared to its traditional counterpart. The terms garbanzo beans and chickpeas are used interchangeably. Garbanzo, the Spanish word for chickpea, is thought to originally come from the Basque word for chickpea, "garbantzu," meaning dry seed. Try some of our best chickpea recipes! In addition to being affordable and readily available, chickpeas are also extremely versatile to cook with. 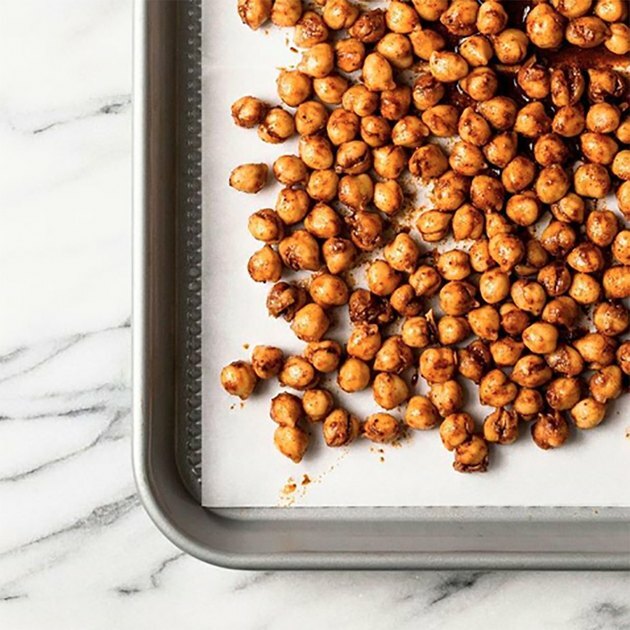 If you're new to chickpeas, try this easy recipe for oven-roasting them. As you get more experienced, test out different types of seasonings to vary the flavors. You can make savory versions or sweet, such as cinnamon or cocoa-ginger chickpeas. For breakfast or a snack, give your avocado toast a nutritional boost by adding homemade hummus. For a filling and energizing lunch you can pack for work, toss together this chickpea salad. And if you like it spicy, check out this warm, hearty and healthy chickpea curry. For DIY hummus that's as beautiful as it is delicious, whip up this beet-based hummus recipe. Or if you're more into a smoky hummus with a sizzling kick, try this chipotle version. What's your favorite chickpea recipe? Did you learn something new about chickpeas from this article? Let us know in the comments. Is Hummus High in Carbohydrates?